Nanometer-sized gold particles of uniform shape and size are invaluable tools in nanotechnology (assembled arrays), light scattering (elastic - plasmon resonance; inelastic - Raman effect) and for single molecule detection. Gold nanoparticles can be attached to proteins, alkanethiols and DNA by various methods. Silver nanoparticles are evolving similar functional characteristics to their gold counterparts. 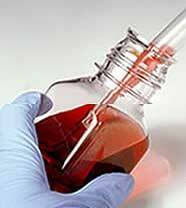 Ted Pella, Inc. is the leader in offering a wide range of gold nanoparticles for these applications. Talk to our applications engineer to find out about the new developments/applications. We are constantly developing new gold colloids for new nanotechnology applications. Gold colloid pH's range from above 5 for 5nm gold to less than 9 for the larger sized particles (pH increases with size). The 2nm colloid is too small to scatter light and the solution is clear. The remaining sizes scatter light to different degrees and the solution color changes with increasing particle size. These products are known to be stable for a minimum of one year after opening. To avoid contamination after opening, it is best to handle the product under clean room conditions to avoid contamination by dust or other airborne contaminants. Temperatures for storage, after opening, can vary from 4-8°C (39-46°F) to room temperature depending on whether the application is diagnostic or research oriented. The colloid is stable on boiling and destroyed by freezing. When storing the product below 8°C (46°F) it is the customer's responsibility to ensure that their refrigerator can maintain a constant temperature in the range noted above. for next day delivery due to temperature requirements. NOTE: Empty cells in the product table below denote items that are no longer available from the manufacturer.